Instead of purchasing graduation announcements, you can make your own at home. Homemade graduation announcements work well for kindergarten and preschool graduations, but if you take your time, you can make them look professional enough for high school and college graduation ceremonies. Graduation cap announcements are made to look like an actual graduation cap that the guests can open to view the details of the graduation. Draw a square on piece of cardstock with the dimensions of 4 inches by 4 inches. Turn the cardstock so that the square looks like a diamond. Draw a line 2 inches in length from the center of the left side of the square. You will make the line starting from the outside of the lower left side of the tilted square. Draw the line straight down vertically. Make another 2 inch line adjacent to this line on the lower right side of the square. Connect these two lines by drawing a curved horizontal line to create the lower part of the graduation cap. Cut out the graduation hat template. Fold a black piece of 8 ½ by 11 inch piece of cardstock in half. 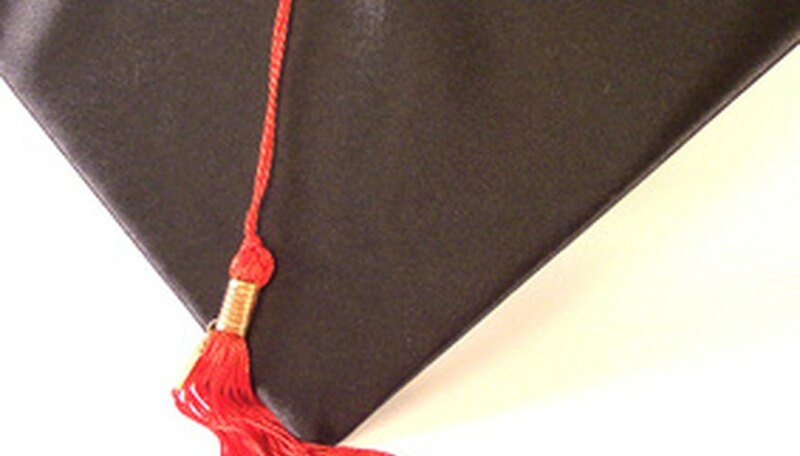 Place the cut out graduation hat template onto the cardstock so that the top point of the cap rests on the fold. Trace the graduation cap with a pencil. Leave the cardstock folded. Cut out the graduation cap, but do not cut the fold. Make the finished card look like your graduation hat template. You will have to draw the lines that you were not able to trace onto the template to complete the hat. Use a marker and a ruler to keep these lines straight. Add a tassel to the graduation card. You can cut out a tassel shape from a piece of construction paper by drawing or you can glue on pieces of yarn to the center of the hat to make your own tassel. Write the details of the graduation ceremony on the inside of the graduation card. Use a metallic pen or print the information on the computer on a piece of white paper that will fit inside the announcement. Customize the graduation caps by using school colors. Add a photo of your graduate to the top inside of the announcement.